Years ago, during a conversation with my uncle, he gave me a huge compliment. He said I was just like my mother. Though there are moments when I look in the mirror and observe with dismay that I’m turning into my mother, my mom has been a wonderful role model as I navigate life. She’s a nonjudgmental listener and unfailingly supports her children and grandchildren. No matter what craziness I share, she has my back. I’m very lucky. I hope I provide the same unconditional love and support to my kids. Chocolate Strawberry Blondie Bites celebrate my mom. I am very excited that my mom will be in St Louis with us for Mother’s Day this year. She is really visiting for my daughter’s birthday on May 9th, but I plan to squeeze in as much celebrating as possible while she is here. Living 800 miles and numerous states apart, we don’t get to spend nearly enough time together. Even if we don’t do much more than cook a bit and shop a bit, it will be good to do it together. As a mom, time spent with my kids is precious, especially now that they are grown. I can’t even imagine how hard it must be for deployed military moms and their children. Every day thousands of military moms sacrifice time with their families in order to do their jobs and serve their country. Holidays spent apart must be particularly difficult. Mother’s Day is a day set aside to celebrate and honor the mom(s) in our lives. It can also be an opportunity to honor and thank military mothers, those who serve in the armed forces and those whose children are service members. Their strength of spirit deserves acknowledgement. I baked these Chocolate Strawberry Blondie Bites with Mother’s Day in mind. Sprinkled with confectioners sugar or topped with chocolate, chewy strawberry blondies studded with chocolate chips are packed with chocolate covered strawberry flavor. They are like chocolate covered strawberries you can mail. Desert safe recipe adaptations make Chocolate Strawberry Blondie Bites an excellent military care package surprise. 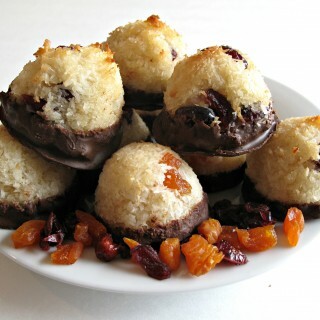 Whether your mom is nearby or far away, these sweet morsels are sure to make her day special! Chocolate Strawberry Blondie Bites bake well and have good taste and texture with either butter or Crisco. If you are sending the blondie bites in extreme desert temperatures, Crisco is recommended for avoiding spoilage. Otherwise, I prefer using butter for creamy flavor and longer lasting chewiness. For the chocolate topping, I used Chocoley.com Molding Formula. It spread smoothly and the slightly thicker formula gave me the slightly thicker chocolate topping I was going for. 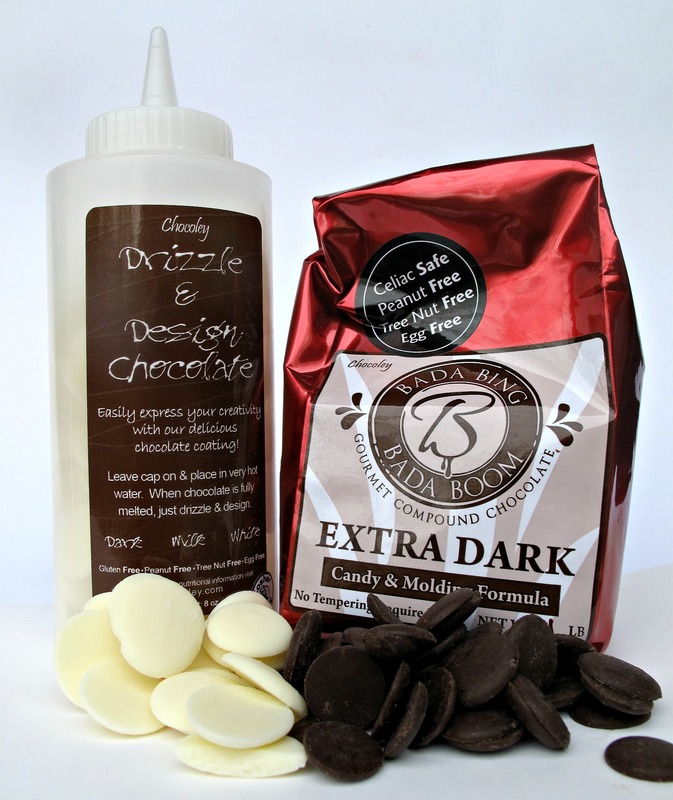 Chocoley.com Drizzle and Design’s thinner formula easily drizzled in thin lines and squiggles. For hot weather care packages, powdered sugar topping is recommended instead. 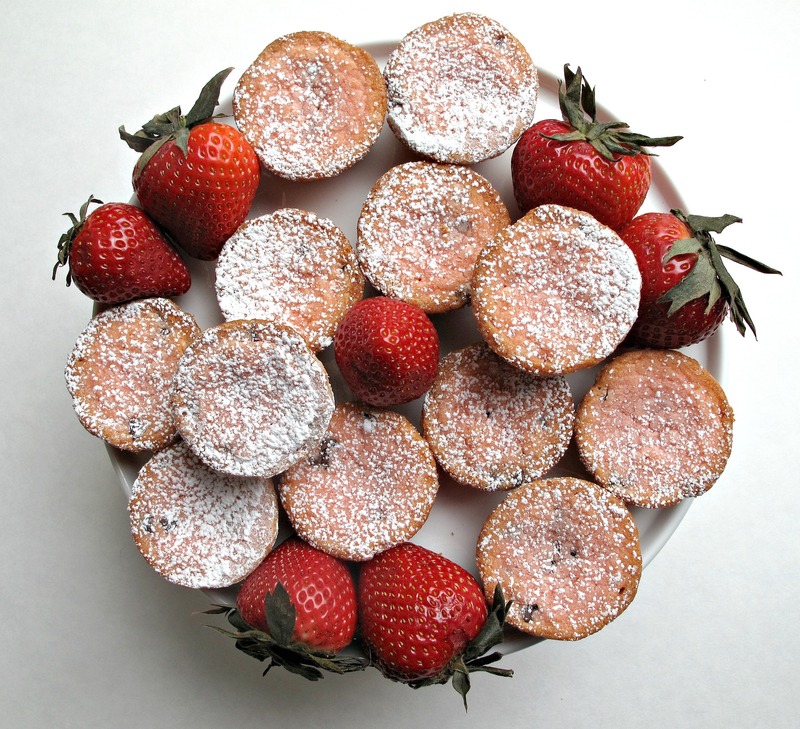 ***Desert safe adaptations: For desert safe baking use vegetable shortening and dust blondie bites with powdered sugar instead of using chocolate decorative topping. Preheat oven to 350° F. Butter or spray cooking oil into 3 mini muffin pans. Place white chocolate and butter/shortening in medium sized microwave safe bowl. Heat in microwave 1 minute at medium power. Stir. If not completely melted, return to microwave for 10 second intervals, stirring between heating, until completely melted and combined. In bowl of electric mixer, beat eggs until foamy (about 3 minutes). Mix in sugar, jello powder, vanilla, and melted chocolate. 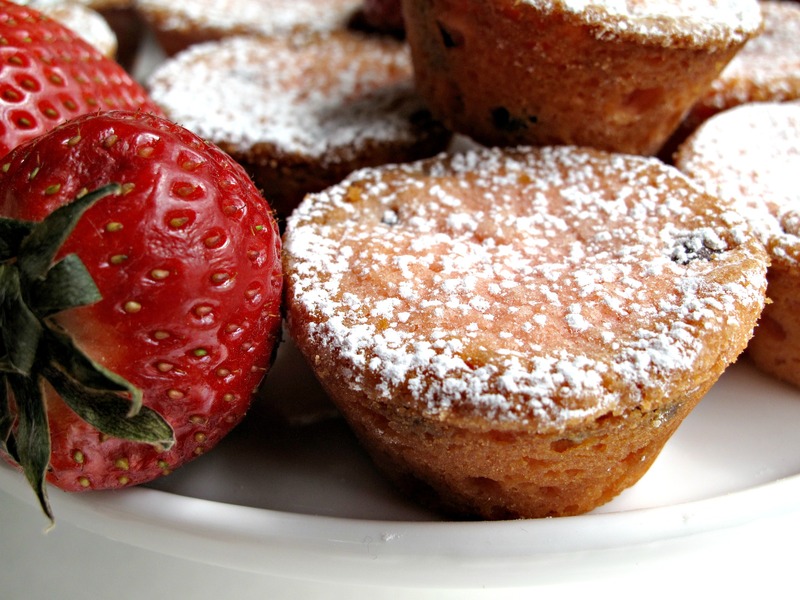 Scoop 2 tablespoons of batter for each mini muffin into prepared pans. Cool for 5 minutes in pan. Loosen the edges of the blondie bites with the tip of a knife if necessary, then remove from pan to complete cooling on a wire rack. If the blondies don’t hold together allow another few minutes of cooling. Do not let the blondies cool completely in the pan or they will stick. Once the blondie bites have cooled completely they can be sprinkled with powdered sugar or decorated with melted chocolate. To decorate with chocolate, melt the dark chocolate and, using a knife or spoon, spread onto each blondie bite. Refrigerate for 5-10 minutes until set and firm. Melt the white chocolate Drizzle and Design in the microwave at medium power for 30 seconds. Stir until completely melted and smooth. Add one drop of food coloring gel and mix until the chocolate is uniformly pink. 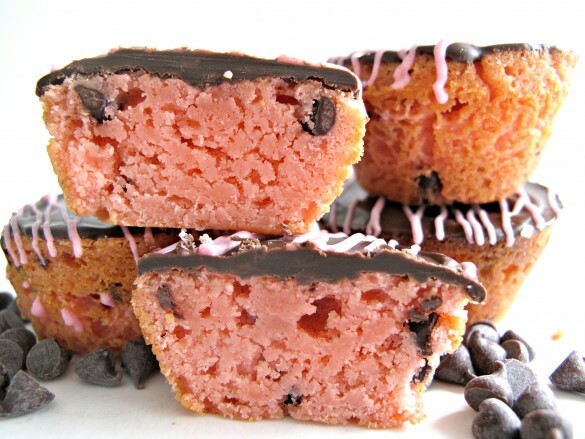 The pink chocolate can be drizzled onto the brownie bites with a spoon or from a plastic bag with a tiny bit of a bottom corner cut off. Refrigerate 5-10 minutes again to set the chocolate drizzle. Blondies bites can be stored at room temperature in an airtight container between layers of wax paper for 2 weeks. Do not decorate blondie bites with chocolate topping if mailing during warm weather. Wrap pairs of blondie bites in a stack, in foil, then double wrap in plastic wrap before storing in an airtight container or zip lock bag. If mailing chocolate coated blondie bites in cool temperatures, wrap pairs of blondie bites in waxed paper before following the above packing directions. Wow! So chic and pretty! Thanks, Catherine! Celebration baking is especially fun! Oh yay! You must be so excited for your mom’s visit! I live far away from mine too so her visits are always special! 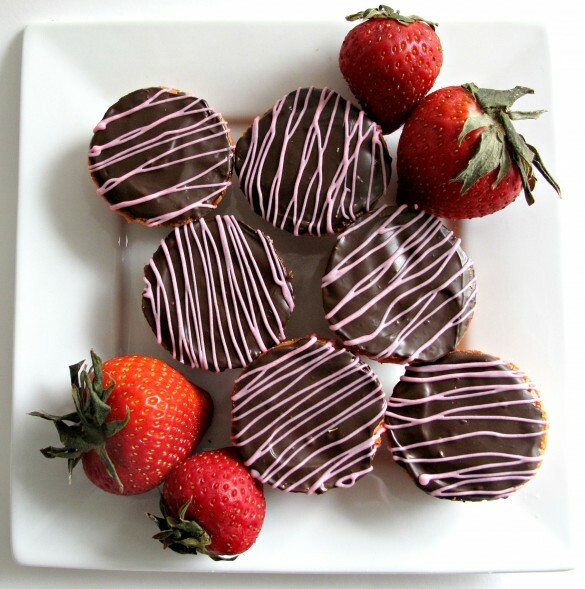 And these bites look just awesome … I mean strawberry and chocolate is always such a great combination. And with that pretty topping! Gosh these are completely gorgeous! I love the pink inside – wow! I also love the tribute to your mom. Enjoy your time together, as I know you will. My mom has been gone for 22 years. She missed so much and hardly a day goes by without thinking of her and what I would have told her. I miss sharing the ups and downs with mom. Take care and great recipe! I love everything about them. Tricia, I have an idea of what kind of mom you had based on what I know about the wonderful mom you are! I too know that the ache of missing a parent never goes away. I “talk” to my dad all the time in my head, wishing he was here to see all the qualities in my kids that come directly from him. I think he would have smiled. As you so clearly described, we miss our parents and our parents miss out on sharing our lives. It stinks. Thank you for sharing the importance of embracing every moment we have with those we love! Thank you also for your kind words about these brownie bites! Wendy, these are so pretty and absolutely beautiful for Mother’s Day. I’m so happy for you that you have such a great mom and clearly she set a wonderful example for you to follow. I hope you guys have a terrific visit together (plus, happy birthday to your daughter)! Thanks for the reminder about the military moms. You are doing a great service in providing all the desert safe baking and packaging tips. Thanks, Monica! I can’t even imagine how heart wrenching it must be to leave your children to serve in the military! Maybe I am just hormonal (likely) but it makes my eyes tear up just thinking about it! I am not sure how many people follow the desert safe baking recommendations…it sure is easier to ignore them…but I am trying to show that it is possible to send yummy treats and minimize the spoilage risks. I hope your Mother’s Day is full of hugs and smiles! oh i’m so excited your mom gets to come visit for mother’s day! I agree: the best compliment anyone can give me is that i’m like my mother, also, although i do feel like i haven’t quite lived up to that in all aspects of life yet. 🙂 i hope you have an absolutely wonderful time celebrating mother’s day and your daughter’s birthday with her: how special. and these blondies…SO PINK! 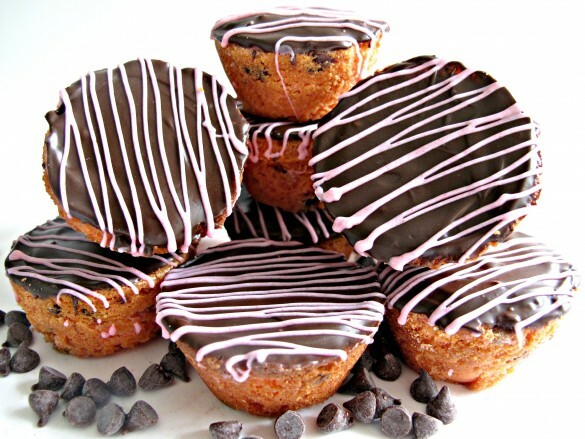 and adorable: your drizzle is really fantastic, and i bet they’re delicious. These look so delicious! What an awesome Mother’s Day treat–bookmarking them for sure! 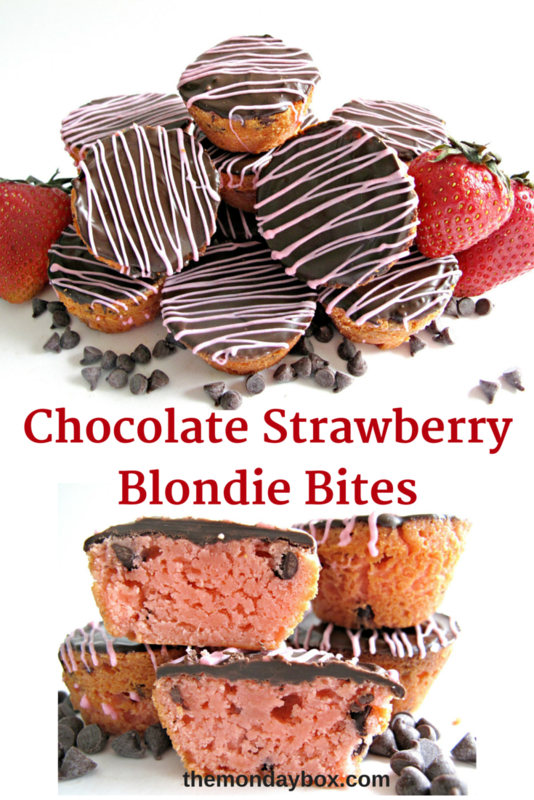 These strawberry blondie bites look really tasty, especially they are chocolate covered! Awesome! Thanks, Lokness! I hope it does work out and that my mom feels well enough to travel. When we were all younger, I traveled to my parents several times a year and my parents traveled to see us several times a year. Now that I am the one doing most of the traveling, I don’t get to spend nearly enough time with my mom. I have several friends whose families live in other countries. The distance and travel expense makes seeing their families difficult. I know you must miss being able to easily see your family. Thank goodness for Skype! But yea, thanks to fast internet and all the new tech stuffs. If it is 15 years ago, communicating will be a lot harder and much more expensive. Aw, this is such a sweet post! I love that you’ve honored your mom in this way. And those blondies sound wonderful! Love your photography too. Hope you have a very happy Mother’s Day! 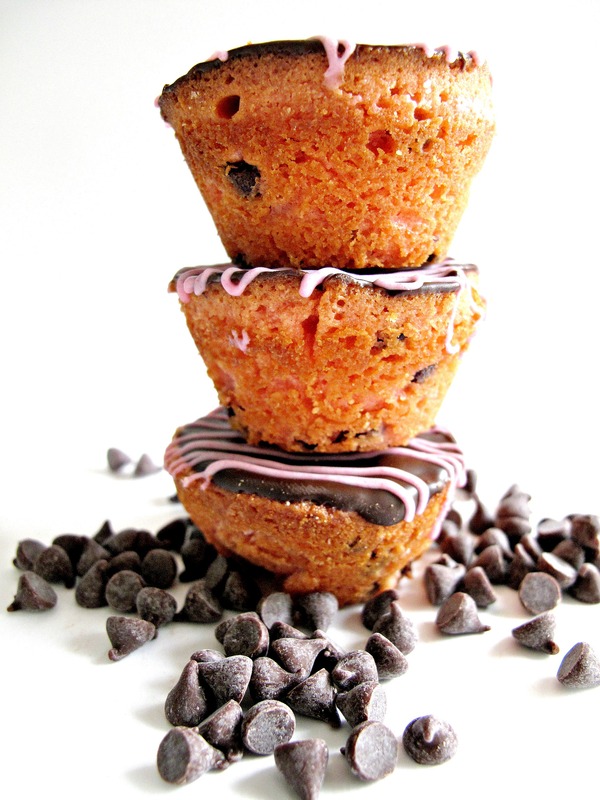 These look so chewy, and delish! And that’s great that you get to celebrate Mothers Day with your mom! 🙂 I also live several states away from my own mom, so I know how you feel! Enjoy your time! Thanks, Jocelyn! As parents get older and as grandkids get older (with lives and plans of their own) it gets harder and harder to live far apart and arrange together-time. I have always traveled as often as possible because I think that connection is so important! Oh. My. Godness. This is absolutely awesome. I can’t believe how amazing you are and how you always manage to make my mouth watering. It’s 10 pm here and I just want to grab one of this amazing blondie bites. I must try it ! They’re awesome. Thanks for sharing such amazing recipes ! Thank you,Amy, for stopping by! These bars really are citrus-y good! Wow, these look absolutely scrumptious!! Thanks, Becca! I think strawberry with chocolate is a natural. Though the blondie is strawberry, there is definitely plenty of chocolate with both the chips and the topping! White chocolate AND strawberry! These sound fantastic. I am also passing along a link to “the Church ladies” who host a mother/daughter high tea at our church every summer. They are so pretty and would make a great addition to the dessert trays! Thanks, Maureen! Oh, I think these blondie bites would be lovely for high tea! Pretty in pink and delicately finger food! 🙂 I hope the Church Ladies enjoy them! Thanks, Lolly! I feel like photography is the greatest challenge in food blogging. We eat with our eyes first so the photos have to be as appealing as the food! I have a lot to learn, so I really appreciate the encouragement! These look scrumptious! Thanks for sharing on Throwback Thursday! Thanks, Mollie, and thanks for hosting Throwback Thursday! So lovely to get to spend time with your Mom -Have a wonderful time! I miss my Mom every day! It’s so important to enjoy our family while we can. 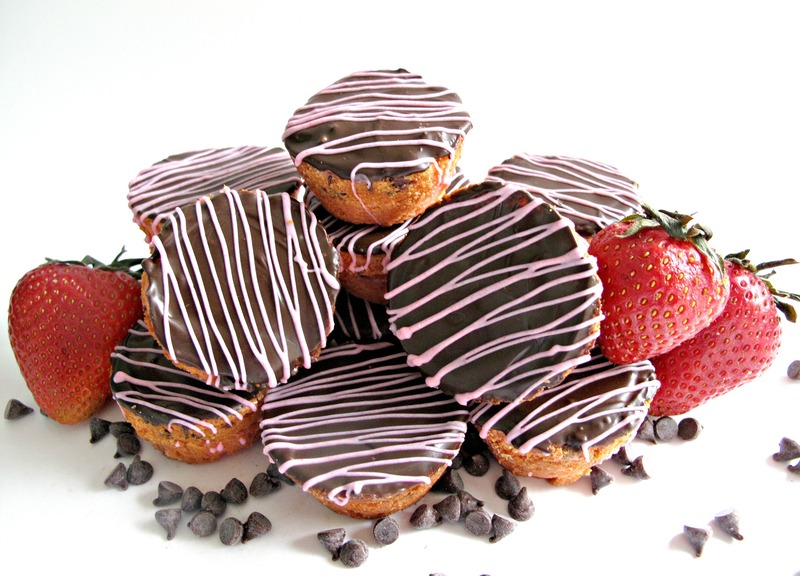 Love these delicious Chocolate Strawberry Blondie Bites- what a treat! Shared on the Hearth and Soul Facebook page. Thank you for sharing with us at Hearth and Soul . What fun little bites! Thanks for linkin’ up with What’s Cookin’ Wednesday! Thanks, Karly! I always enjoy What’s Cookin’ Wednesday! What a great combination of flavors! Thanks for sharing at Funtastic Friday. These blondies look so delicious and perfect for Valentine’s Day! Thanks for sharing them with us at FF! Love that you honor our military families, Wendy. And how wonderful that you have such a lovely mother. Trust these treats were a big hit….Thank you for the keeper recipe. P.s. Stopping by via April’s Hearth and Soul Party. 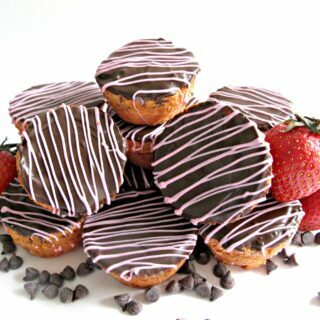 Your Chocolate Strawberry Blondie Bites look delicious! I really appreciate you sharing with us at Full Plate Thursday, hope you have a great day and hope to see you again soon!